The Silk Road is something of a departure from previous Hot Spots volumes. Instead of a single city, it covers a large, more vaguely defined, and much more culturally diverse region. 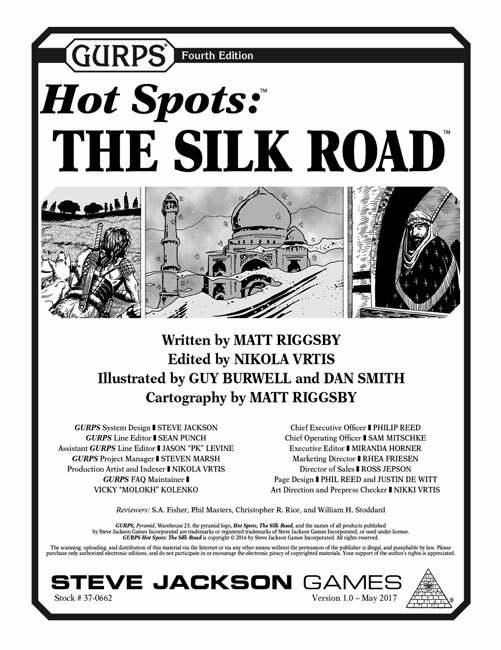 In the pitch I sent to SJ Games, I described it as being more like GURPS Conan than any of the previous Hot Spots. It's more about trends and areas than specific people and events. And I think that actually makes it a much better setting for setting adventures. It's more of a sandbox (indeed, the Taklamakan desert is one of the world's biggest sandboxes) where the GM is relieved of the weight of specific historical events. And the specific nature of this region and its time make it easy for anybody from that time (or, at least, any sort of person, from Vikings and Berbers to samurai) to plausibly show up as PCs. GMs and players alike are frankly spoiled for choice. People modestly familiar with the term "the Silk Road" may be a little surprised by the temporal coverage. A lot of the really basic mentions of the Silk Road in the West talk about Marco Polo and the Mongol empire. But that's really just when the West, which had previously been a mere appendage to the China/India/Persia trade, started to get more hooked into the old trade routes of Asia. By Polo's time, the overland silk routes were in decline. The real story, I've found, is in the ancient and early Medieval periods. I have some vague ideas about follow-ups and companion pieces, but the problem with Hot Spots in general is finding sources covering the right mix of topics for the right places and times in languages I can read. An explosion in Silk Road scholarship over the past couple of decades has been invaluable for this book (particularly mad props to Lin Xinru, Valerie Hansen, and Susan Whitfield), but it's more difficult to find sources for the places I have in mind, which haven't been subject to quite so much attention in English-language sources. What I said some time ago about why GURPS historicals are still useful in the age of Wikipedia still stands, but, damn, that's a lot of interlibrary loan.